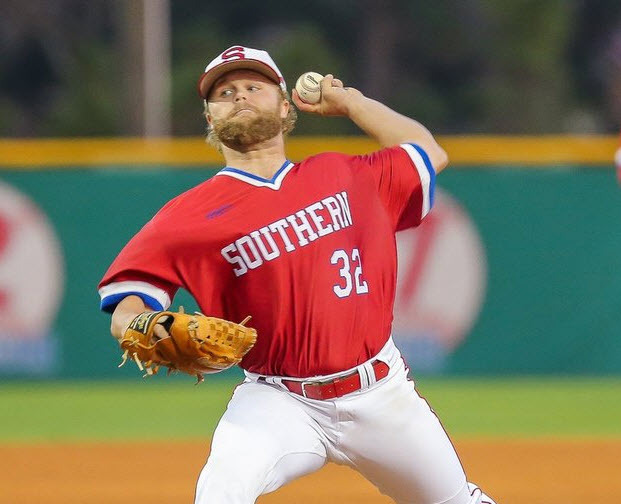 Florida Southern’s Logan Browning has been named the winner of the 2018 Perfect Game Josh Willinhgam Award as DII baseball’s Most Valuable Player. The award is named after former University of North Alabama Lion star, Josh Willingham, and honors a player who not only excels on the diamond, but in the dugout, clubhouse and practice field as well, and leads his team to national championship caliber status. This season Browning paced the Mocs as they competed for the program’s tenth baseball national title. FSC finished the season 45-11-1 with a third place finish at the D-II Baseball Championships. Browning topped the team in batting, finishing the season at .440 with 14 doubles, three triples and four home runs. Despite this he may have been more valuable on the mound. He made 18 starts and one relief appearance (in which he earned a save) compiling a 3.07 ERA with an 11-2 record. In an elimination game at the D-II Baseball Championship he struck out 11 Columbus State batters over six innings in a 3-2 win to keep the Mocs’ title chances alive. As a whole in the national tournament, Browning collected five hits in 12 at-bats for a .417 average in his three starts in right field. Three of his five hits were doubles and the Lakeland native drove in five runs while posting a .500 on-base percentage. He also walked once and was hit by a pitch. On the mound, Browning was 2-0 with a 2.77 ERA. He struck out 22 and walked two in his 13.0 innings pitched. Browning, who was only one of two D-II players named on the on the Golden Spikes Award midseason watch list, was also named a First Team All-American selection by the NCBWA and a Second Team All-America honoree by the D2CCA and was a First Team D2CCA All-American in 2017. While playing baseball at the University of North Alabama Willingham was a two-time All American and tied or broke 14 school single-game, season and career records. After his junior season he was selected by the Florida Marlins in the 17th round of the Major League Baseball Draft and played at the highest level for 11 seasons, the pinnacle of which was when he earned a Silver Slugger Award after batting .260 with 35 home runs and 110 RBI in 2012 for the Minnesota Twins.